Your valuable time helping with the Monuments Tour of Historic Murphysburg at Mount Hope Cemetery on June 14th was a great success thanks to the 25 volunteers that made the tour possible and fun. .Historic Murphysburg Preservation, Inc. will think outside their block by hosting a guided tour of significant monuments and mausoleums at Mount Hope Cemetery. Have you ever wondered what a mausoleum looks like behind ornate solid bronze doors, how the family acquired their wealth, and their contributions to the boom of the area. Saturday, June 14 from 5:30 to 8:30 p.m. is your chance. 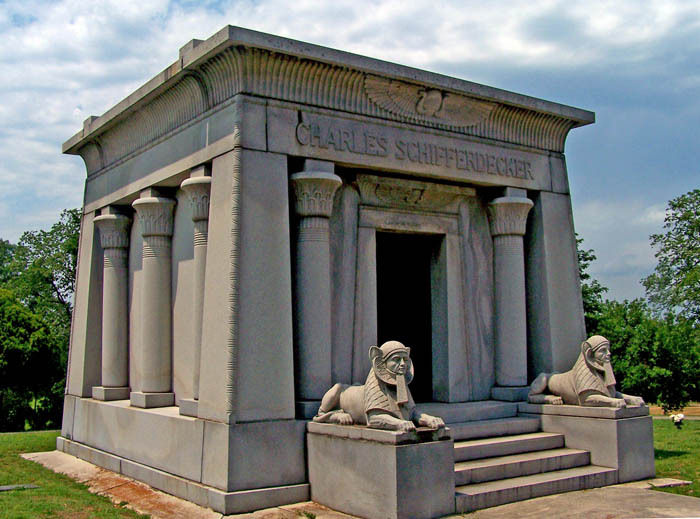 The mausoleums of Charles Schifferdecker, A.H. Rogers, and Austin Allen. Selected mausoleums will be open for the tour. These gentlemen contributed significantly to the permanent fabric of the Joplin and Webb City area, such as in the donation of a park, the creation of a streetcar railway system, the architecture of the Newman Building. Many original Murphysburg homeowners also brought art and culture to the area. Attendees will also learn about the history and architecture of this historic cemetery established in 1905. Purchase tickets at the tour or in advance on our web site on the donate button below. Tickets are $10 per adult; children get in free. Friendly dogs on leashes are welcome. Pet owners must clean up after their pet. Mount Hope Cemetery represents an extremely valuable cultural and historical asset of the four-state area through their genealogical information, gravestone architecture, and iconography. Joplin co-founding father Patrick Murphy and Webb City founding father John Cornwell Webb are both buried in the cemetery. The cemetery was designed in 1905 by Hare and Hare, who later went on to assist in the design of the Kansas City Country Club Plaza and Nelson Art Gallery. The engineering wonders that Mount Hope Cemetery provides contain splendid architectural structures that have remained unspoiled for over 100 years. Your host, Historic Murphysburg Preservation, Inc., a non-profit organization, is dedicated to the preservation of Joplin’s oldest downtown residential neighborhood through education and community involvement. In cooperation with the National Trust for Historic Preservation, HMP celebrates the trust’s theme for 2014 which is, “New Age of Preservation: Embark, Inspire, Engage.” It is meant to excite current supporters and introduce new audiences to the work being done to enrich and preserve the places that make the Joplin community special. Historic preservation gives the citizens of Joplin a deeper understanding of their diverse heritage and a greater appreciation of our unique historic and natural resources. Historic preservation is an effective tool for managing growth, revitalizing neighborhoods, creating economic opportunities, fostering local pride and maintaining community character while enhancing livability. HMP urges our citizens to acknowledge the importance to celebrate the role of history in our lives and the contribution made by dedicated individuals in helping to preserve the tangible aspects of the heritage that has shaped us as a people. Contact HMP through the following options: (417) 483-3116;www.murphysburg.org; Facebook.com/Murphysburg; or e-mail at Murphysburg@gmail.org. Contact Mount Hope Cemetery at (417) 673-1590 www.mthopecemeteryofjoplin.com.